As we usually say in my country, "Age doesn't matter." Oh, but it does matter to many people. But I don't expect a similar public outcry here if the guy was older. People used to call them DOM (dirty old men), but nowadays it's almost generally accepted by society. The ridicule comes when the woman is the older partner. She's not only called a cougar (which is a fairly recent moniker), she's a "cradle snatcher"! There's a 60-something female celebrity here who has a 20-something guy for a boyfriend, and she's just universally reviled. It's a double standard. I guess that makes my country worse for May-December affairs than yours. Love transcends every barrier...age, wealth, health, looks. Its their life and let them be happy. When it comes to public figures and celebrities, every thing they do or don't do becomes a subject of ridicule - it is the price, however unfair it maybe, of stardom, i guess! I think level of maturity, compatibility and friendship have more to do with success of marriage than age. Good luck to this couple. And to all of us who are married and working hard at our relationships. ah!!! this one hits exactly at my tender spot....as i told you earlier i am a victim of this age bias too. there have been incidents where even after dating multiple times and getting to know each other well- i was turned down by a girl because i had crossed 30 and she didnt want to marry a 0-year old guy- her friends would laugh it seems. well it takes all kinds to make this world..nice post susan...something which i wanted to write about too..but you beat me to it. i wish them the same as well...my parents are actually 9 years apart...to make it even weirder, my mom taught my dad in sunday school at church at one point...but it was well later that they met...i think that if mutually consenting and not of a minor age, what is the big deal...its their life to live.. Pretty neat take on the recent hue, Susan. The thing is Saif was painted as a man who feared committment by the media every now and then pretty loudly. So it was etched in the public's mind that the wedding would not happen. When it did, they resorted to the equivalent of name calling which is posting snide remarks on FB! Poor celebrity. Love sees no age gap is of course one thing. But are wiiiiiiiide age gaps a good thing? Incl. the Harrison ford thing is she not expecting him to "be around for her" when she is 50 or is his wife planning to dig the grave?? Marriage is more of companionship is it not? Believe me when I say age is just a number. My man is quite a bit older than me and the age-gap has never been a problem. I think true love knows no age barrier. And, with you, Susan, I detest the "tabloid takes" on everything celebrity. After all, these stars are, first and foremost, people with feelings and sensibilities. Shouldn't they be treated with dignity instead of exploited in the name of the almighty dollar? May this couple know wedded bliss and lasting happiness together! My ex was more than 10 years older to me...age wasn't really a barrier more so than other issues in the relationship. At the end of the day, if two people in a relationship are happy and consenting adults, age shouldn't be a barrier. Gossiping is our favorite time pass and we love doing that! My parents have an age difference of 10 years too! In our country, a seventy year old and a fifty five year old are going to attract a lot less negative attention than a 16 year old and a 31 year old, even though the age difference is the same! I agree, we should leave Saif-Kareena alone and focus on our own issues at hand! Simple.. everyone has everything to say to all but they won't say anything on what is happening in their own house and most of the times those who say a lot have a lot to hide too..
many people even said Marriage is illegal as per Islam, it does not matter India is a democratic nation. About age gap fools do not or try to show they do not know history that 50 Year old man married 8 year girl old in this same country. 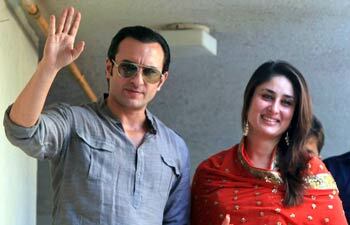 Majority times who ever hated marriage he was angree about beautiful kareena marrying Saif for various reasons. Dear Susan, my first serious relationship was with an older man. I would say I fell in love with him due to awe and admiration and we had a lot in common when we met - I was 25 and he was 36. And I was just a kid. But then I grew up and changed and at one pint the age difference became obvious. It did not last (even if it lasted more than a decade), but the failure had to do not just with the age difference, but also other factors. But with that said, I believe age matters very little when it comes to love, it all depends on the people involved. Some young people are very matured, some older are very young at heart. I don't think age and love are connected. What is important is that the couple share as many goals and values as possible. Compatibility - what makes a relationship work is more than our social variables, I think. Absolutely! 10 years age gap is common in India. You are right Susan! Facebook was literally jammed by the number of mentions of the picture you have referred to. I do not understand the fun people derive out of commenting on someone's personal decisions. Both Kareena and Saif make a lovely couple, and look absolutely in love. Maybe it is their happiness or celebrity status that has caused some jealous and insensitive people with vella (free) time on their hands to dish out crass comments. Nope - age and love have no connection. I wonder why we as a society cannot get over this. We snigger at older men and younger women and cry foul over a younger man and older woman. Why cannot they feel for each other is something that is beyond my understanding and logic. It is love and it just happens. Do we all wear our age, caste and creed to avoid all this? then it won't be love anymore!! Well said Susan. I too felt that it's none of our business to comment about the age difference between a couple who want to get married to each other. Those Facebook posts on Saif and Kareena were not bonafide at all. Sometimes it is appalling to see how Facebook users who are well educated and from good families go about dishing out crass comments. Just as there need not be a connection between age and love, I am fast reaching a conclusion that there is no connection between one's education and social behavior particularly on the net. You have written what was in my mind Susan. I too was disgusted with such things floating around on the internet. I feel if the two them are happy and get along well, why should anyone even care. Love and age are two separate things. They are not connected at all. within reason I don't think age should matter. Within reason I mean not 30 years although I met a couple one time where the very good looking and in great shape gentleman was 67 and the girl was 32, they seemed happy. My Dad was older by 10 years to my mother. Its not the age difference that matters, its how you treat each other.